If you entered the world as "Troy Wilder," what would you do? Would you look to master a curve ball or the highball? Practice in the batting cage or the firing range? The name sounds so grandiose for low-minors pitching, like pouring Dom Perignon into a coffee mug. It's been 30 years since his flirtation with pro ball, but I like Troy Wilder, International Man of Mystery or Sgt. Troy Wilder of the Yukon Patrol over Troy Wilder, Man with Undersized Chief Wahoo Hat. 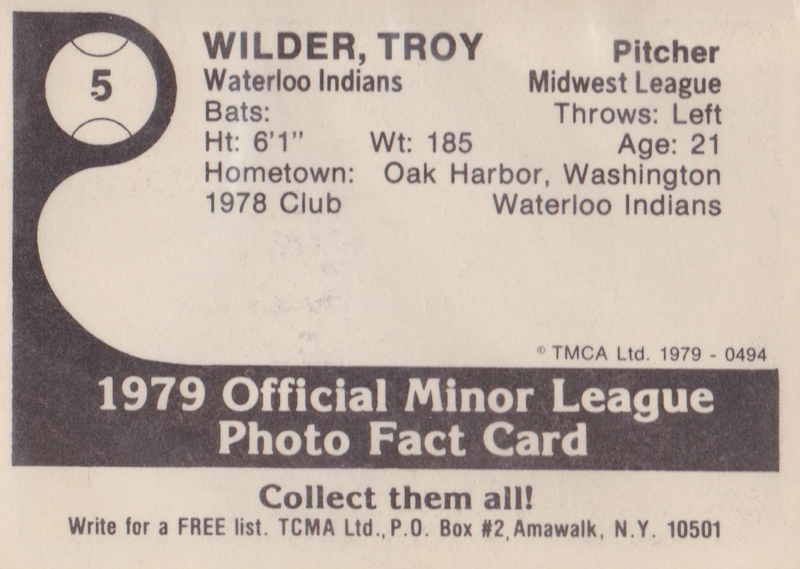 Troy Wilder achieved the rare feat of appearing on three different 1970s single-A minor league cards, first with the 1976 Batavia Trojans and then Waterloo for 1978 and 79. There's a big empty space for stats here, but you can combine his Baseball-Reference page and Baseball Cube pages to fill in the gaps. 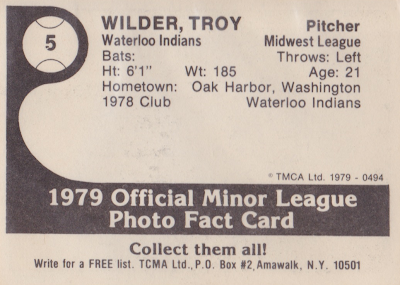 Wilder spent five years in the Cleveland farm system at single-A and AA, and while I don't think of the 1970s Indians as rich with pitching, something must've stood in Troy's way, because neither he nor many of his bullpen mates reached the bigs. In 1979, their AA Chattanooga squad had a decent season, going 75-69, but none of their 17 pitchers went on to appear in the majors. Zero! Certain leagues are known to be "easy" on hitters or pitchers, but going 0-for-17 with a pitching staff sounds like bad management. 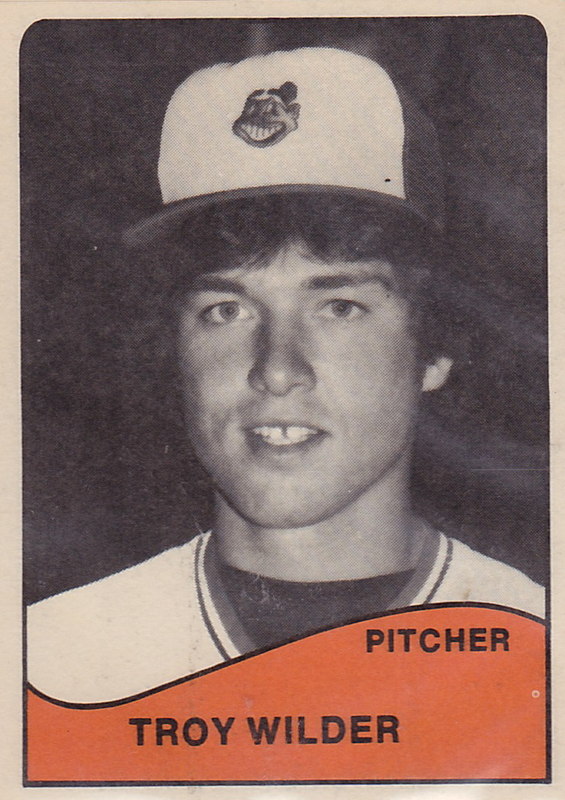 Senior execs probably fell all over themselves to promote slugger Joe Charboneau, who victimized Southern League pitching for a 1.019 OPS prior to his inspiring-but-brief major league run. Too bad those early-80s Indians couldn't just start Bert Blyleven and Rick Sutcliffe every other day, Old Hoss Radbourn-style. Value: Troy cost $2 at MinorLeagueSingles.com, about right for non-stars from that era. I had to look it up because I didn't know if that was Waterloo, NY or Waterloo, IA. Yeah, TCMA published a bunch of 1970s Iowa sets, though did reach New York in 1979 for a few teams, including Syracuse and Rochester.